Great Expectations by Charles Dickens completely took me by surprise and exceeded all of my initial expectations. It is the best book I have ever been assigned to read in school (I read it with my AP English class) and my favorite book of 2015 so far. There are so many fantastic aspects of this novel- fitting them all into one review is going be a struggle! Let’s start with one of the most obvious great things about this novel: Pip, the main character. I was captivated by Pip’s narration from the very first sentence. His youthful spirit and personality shine through the writing, and I couldn’t help but want to support him and cheer him on throughout the entire story. He certainly as flaws (his extreme naivety and impressionability, for example) but they only sere to increase his charm because he is so easy to relate to. The mistakes he makes can be translated to our own lives quite easily, despite the fact that his circumstances are quite unique. Also, I really liked the fact that even though Pip is telling the story when he is much older, his narration nevertheless reflects his age at the time. For example, during the beginning of the book his childish fear of the convict and ignorance of current events (the Hulks) are captured perfectly by the impressive vocabulary of adult Pip. Not only does Pip’s narration create more depth to his own personality and development as a character, but it also makes the story even more entertaining. Pip isn’t the only remarkable character, however- Dickens has created an entire cast of incredible personalities to captivate and enthrall us. Take Miss Havisham, for example. She’s so heartbroken that she’s driven herself insane, locked in the moment of her wedding day before it all took a turn for the worse. Or Estella, the girl Miss Havisham has been training to break the hearts of men like she herself was never able to do. And then there’s Mr. Joe Gargery, the husband of Pip’s abusive sister, whose heart is so kind that even in Pip’s darkest times, he reminds him that they will always be “ever the best of friends”. There is more than meets the eye to nearly every character in this novel, and by the end I was astounded by how seamlessly their lives connect and intertwine. The plot itself was captivating and never dull, even though the book is quite long. Between Pip’s entertaining narration and countless twists and surprises I was never bored. This is very much a character-driven novel, but the plot was still interesting and well planned out. I love the fact that there are two endings- the one that Dickens originally wanted to include, and the one that ended up being included in the story that is published today. The publisher back then (or person he was writing for, I don’t know if it was necessarily a publisher) didn’t like how the original ending was not very happy, so Dickens wrote one that had more of a “happily ever after” feel to it. The copy of this book that I got from my high school’s library had both endings in the back, and I have to say that I like the original one better. It fits the bittersweet tone of the book way better than the other ending does, and I can’t help but think that if Dickens initially wanted it to end that way then that’s the way it should end. I was really surprised by how much I loved the writing in this book. 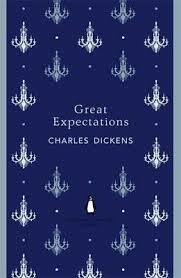 I enjoyed Dickens’ writing style in A Tale of Two Cities, but I absolutely LOVED it in Great Expectations!! It was witty and charming and there were times when I actually laughed out loud while reading it. (Sorry people in the school library during eighth period- Dickens is just too funny!) The word choice was impressive but not overwhelmingly difficult to understand, and there are just so many quotes that I couldn’t help but highlight in my book. Dickens’ writing is definitely one of my favorite aspects of this book! Overall, I LOVED LOVED LOVED Great Expectations- when I finished reading it I felt like I wanted to give it a hug and read it all over again. It’s such a timeless story, mostly because it is so easy to relate to the feelings and experiences Pip has as he grows up. I am so happy that I was assigned to read this for class- if this doesn’t prove that my teacher has great taste in books, I don’t know what does! Would I recommend it to a friend? : Absolutely! Anyone and everyone should read this book! Have you read this book before? What did you think of it? What other books by Charles Dickens would you recommend? Let me know in the comments section below! I don’t believe that I haven’t read this book. I think that I haven’t read many classics after all. Great review! Wow, I can’t believe it! I LOATHED this book. Like, epically hated it. I found Pip to be THE MOST selfish character in literature ever. And that includes Alec Lightwood. After everything Joe did for Pip, how could Pip toss him aside just because Joe didn’t have the means to help Pip to become a gentleman? As soon as I read that scene, I could NOT continue. I can’t stand selfishness. Sorry to hijack your comment section. I get into rant mode every time this book is mentioned! haha that’s okay! I love hearing different opinions on books, so it’s all good! Those parts made me angry as well, but I viewed them as part of the process of growing up. Pip does change for the better by the end, and he realizes that he was completely wrong to treat Joe that way. Without that dip in morality on Pip’s part, there wouldn’t have been any room for growth as far as character development goes. That’s how I saw it, anyways. I read Great Expectations years ago and it just wasn’t my favorite of Dickens but my Dad loves it so I’m determined to re-read it. I think perhaps I was just too young for it because I’ve enjoyed all of the other Dickens I’ve read. This is a great review! Now I’m even more interested in reading this book, and any work of Dickens. I’m too overwhelmed by classics most of the times, and this book is THICK! It’s so intimidating. I loved how you mention that you like his writing style – wasn’t it difficult to get through at all? How long before you were able to finish the book?? It took me a few weeks to read this book, but that’s because I would read about 30 pages each school night and then 50-100 pages each day of the weekend. I had to take notes and everything while I was reading it for my assignments, so that sort of slowed me down. It’s a thick book, but once you get used to the different accents of the characters and the way Dickens writes it’s not that bad. You just have to be careful because he often drops huge plot twists or important details in the middle of random paragraphs instead of making a big deal out of them, so if you don’t read closely enough you could miss a lot of important stuff. But all in all, it’s not as difficult a read as some of the other classics I’ve read. It’s definitely worth it! Wow, thanks for the tips! I’m gonna give it a go this year. 🙂 I’m encouraged to read from Dickens. Great review… the only Dickens I actually like! I am a Jane Eyre fan, however this is one of the classics that I will want to read one day too. Very nice review, keep up the good work!